I've been a bit remiss of late. I had expected to post more regularly than this in the weeks following the launch but I have been pretty busy with interviews and spin-off work since 'Gillie' was released. In that time Dundee have announced they are effectively skint and are considering administration for the second time in a decade, I've heard an unsubstantiated rumour that Coupar Angus was going to erect a statue to Gilzean, Spurs have revived memories of the Glory nights with a resounding Champions League win and Gillie has been pictured here http://plixi.com/p/47513707 with a Spurs supporter named Jason Evans, who spent the best part of 50 minutes chatting to Alan recently and even got him to sign a specially designed 125th anniversary shirt. 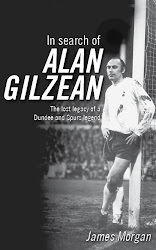 In the meantime, I have had numerous emails and letters from fans of both the book and Alan Gilzean. I have already told those whom I have responded to that I am extremely flattered by their kind words. For those who have contacted me and not heard back, apologies. I will be in touch just as soon as I get a chance. I have been overwhelmed by the reaction to the book and in recent weeks a number of reputable organs have either previewed or reviewed it. I enclose these shameless plugs below for your perusal. "He was far better than Berbatov," said Ian Ure, the centre-half in Dundee's title-winning team in 1962. "If I was a football manager and you gave me the money to buy one of them, then it would be Gillie every time," concurred Pat Liney, the goalkeeper in the same team. 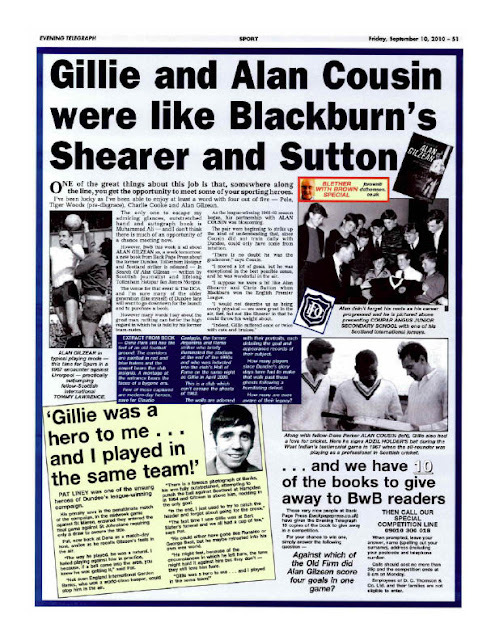 The 100 or so guests who attended the launch of In Search of Alan Gilzean in Dundee Contemporary Arts Centre yesterday could hardly have realised the significance of the words they had just heard from Gillie's former team-mates, two central characters in the book. Less than 24 hours later, Dimitar Berbatov would single-handedly guide Manchester United to a 3-2 win over Liverpool in a thrilling Premier League match, the highlight of which was a sensational overhead kick by the Bulgarian. It wasn't just that Ure and Liney expressed the sentiments, though, it was the assurance with which they did so that made their claim that Gilzean was Berbatov's superior all the more convincing. It proved a fitting end to a wonderfully nostalgic launch. The Dundee legends were full of tales about the title-winning team and their former team-mate with the golden touch. Ure remembered losing his temper with Gilzean because he felt he wasn't putting in a shift during an away match against Cologne in the European Cup, losing his temper with a German opponent whom he booted in the ribs in revenge for an earlier challenge and losing his temper with another goalkeeper, Bert Slater, who, concussed from a blow to the head, wouldn't come round in the dressing-room at half-time, despite several slaps to the face. There were plenty of belly laughs at that one. But perhaps the funniest tale was left to Pat Liney. Recalling an FA Cup tie against Spurs whilst playing for Bradford City in the 1970s, he recounted the teamtalk before kick-off. "Our manager was making plans for corners to Spurs," said Pat. "He was telling Norman, our centre-forward, to come back and pick up Martin Chivers every time Spurs had a corner. He went through most of the team. And then I said to him, 'What about Gilzean?" and he said, 'Is he good in the air?'. To which I said 'Well, he scored about 50 goals one season in Scotland and 40 of them were with his head.'" It was a good weekend for the Gilzean brand. This morning, Jimmy Greaves recalled his former strike partner with real warmth and affection in his weekly column in the People, but claimed that he hadn't spoken to his "blood brother" in 40 years. And finally, for all those who missed the launch we're hosting another Gillie night next month in NPH Cinema in St Andrews on Saturday, 23rd October at 8pm. It promises to be another great night. We will also be announcing details of Spurs-themed Gillie nights in the London area in the near future so keep checking the blog or http://www.backpagepress.co.uk for further details. For those who missed it, this preview appeared in last week's Dundee Evening Telegraph. Look out for forthcoming reviews of the book in the national press in the coming weeks. In Search of Alan Gilzean, the biography of one of Dundee's greatest players, is out on September 20, but you can be a part of the official launch, at Dundee Contemporary Arts on Saturday, September 18, from 10am until 12pm. The author, James Morgan, will introduce a film of some of Gillie's best bits. He will then be in conversation with Pat Liney to talk about the player he saw develop at Dens Park, the part Gillie played in the championship team of 1962 and the man behind the legend. There will be a Q&A session and the opportunity to buy copies of the book, which James and Pat will be happy to sign. To claim a free ticket to this event, e-mail backpage@backpagepress.co.uk. with 'Alan Gilzean launch' as the subject. Please indicate the amount of tickets you would like. Maximum of four per person. Places are limited and tickets will be awarded on a first come, first served basis. Good luck. Edit: I have just been in touch with Ian Ure's wife (Ian is out of the country at present) and he has confirmed that he will also be in attendance. There seems to be a bit of confusion about the release date for the book. Officially, it is Monday, September 20th but some people have already received their copies because they have ordered them directly from BackPage Press. BackPage have several hundred books at their warehouse whereas Amazon have not received their copies . . . yet. They will do, just not as quickly as BackPage. It follows then that if you can't wait for your book, you would be better to order it direct from the publisher. You can do so by following this link: http://www.backpagepress.co.uk/purchase.htm and you'll also get a free ebook. There has been a very positive response from those that have received their copies and that's because BackPage Press have made a first class job of the production - I hope my words have done them justice. There are a number of Gillie-themed events planned over the coming weeks. Launch day is at the Dundee Contemporary Arts Centre at 10am on September 18th and we hope to have a number of players from the Dundee league-winning side in attendance. BackPage have been busy putting together a 15-minute film about Alan's time at Dundee and Tottenham and there will be an opportunity to ask questions afterwards. More details to follow. As for Spurs, there are plans in the pipeline to host a Gillie night in the London area and I am aware that there is a campaign underway to try to get him back to White Hart Lane in the near future. That's it for now but I intend to provide a few more updates in the days before release and hope to see you soon.